For a fundraising initiative to go viral, you just need to get as many people to tell others about it – on social media and via email. Those shares, in turn, should generate more traffic to a project’s page, and drastically increase chances of reaching the funding goal. But note that I said, should. That’s because social media shares or emails do not automatically result in clicks and visits. To generate those, you need to optimize your social sharing and email sending processes for engagement. In this post, I’ll show you exactly how to do that. You’ll learn how to set up your default email and social messages so that they would compel others to act. Let’s not beat around the bush here. When it comes to achieving virality, the numbers truly are against you. There are 6000 tweets sent every second. Facebook users generate 4M likes every minute. And last year, we sent 269 billion emails per day. And I’m sure you’ll agree, that’s a lot of noise for your viral messages to compete with. Also, potential donors are becoming familiar with the marketing tricks brands use to manipulate them. Now, this doesn’t necessarily stop them from donating. However, it would affect their choice of an initiative to back. Finally, there’s the growing skepticism towards fundraising. In 2016, a research conducted by the British government discovered that trust in charities has dropped to all-time low, at 57%. Donors have become extremely choosy as to which initiatives to support. In the context of virality, this means that they won’t simply act on an initiative or project just because someone shared it with them. Stop relying on a user to write an engaging message. Instead of leaving it up to them to convince others to check out a project, give them a ready-made copy they could use. The benefits of using email for making fundraising projects go viral are irrefutable. First, email is personal. Unlike social media messages, this channel connects you directly with the recipient, even if it’s a complete stranger. It remains the main communication channel too. Various research projects predict that email usage is only going to go up in the coming years. Not to mention that it works. Just consider the feedback we got from DonorsChoose.org. After improving the email sending process, the company saw a 65% increase in emails sent. As a result, as Tea Ho, the company’s product designer revealed, more projects get funded. The ease of sending, particularly, importing recipient’s email addresses. Easy access to the address book. 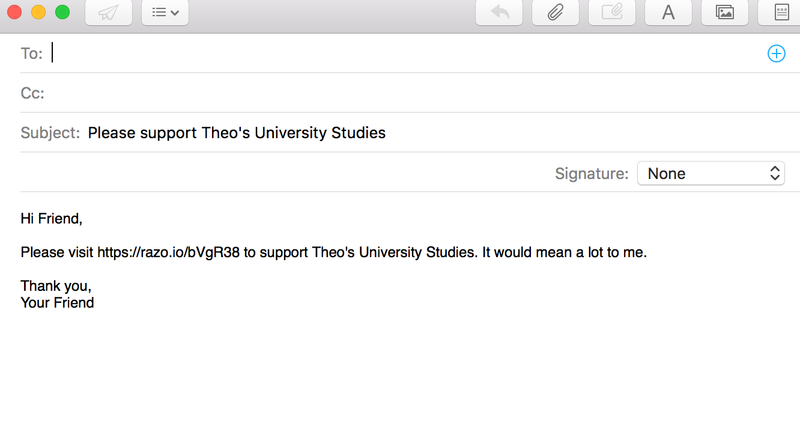 The challenge with emailing about fundraising projects is that those emails rarely go to a single person. Users send them to at least their family or friends, making the number of recipients significant. The problem? Having to copy those emails from their address books might prove to arduous to undertake. 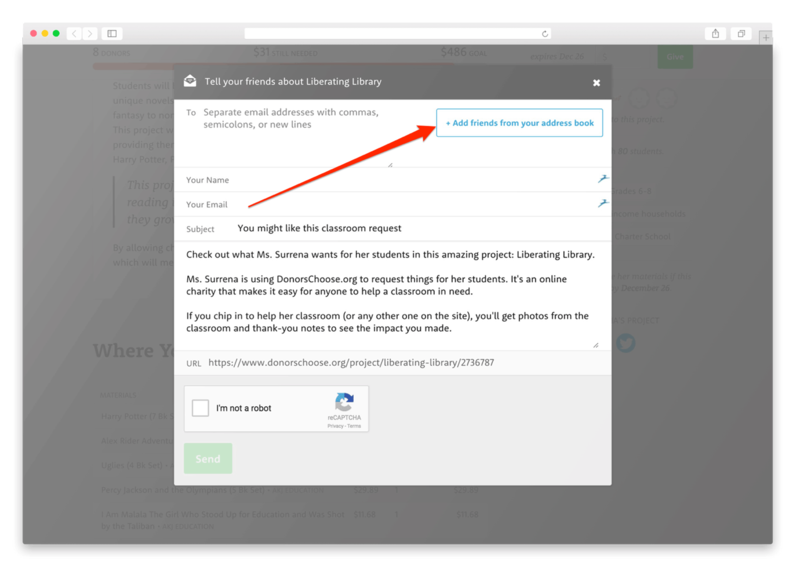 Allowing users to import emails from their address book directly into the email was the first cornerstone of DonorsChoose.org’s success. 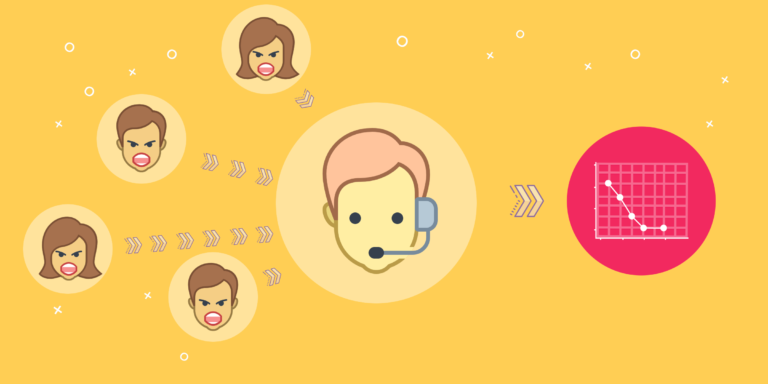 With solutions like CloudSponge, users can tap into their address books and import emails of every person they’d like to tell about a project in a matter of seconds. Note the word emotions above. It’s the key to unlocking those clicks and visits. 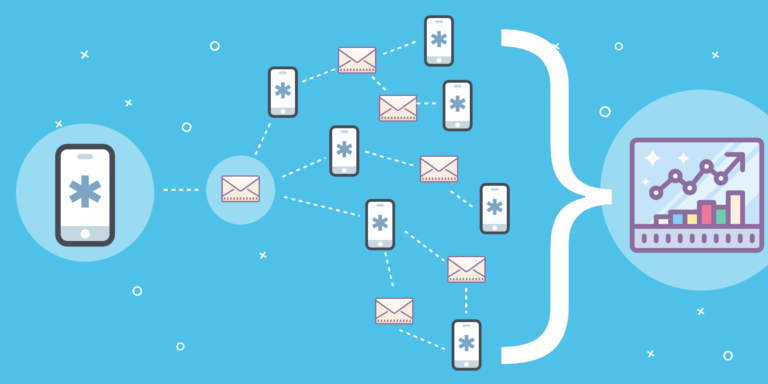 For you, this simply means that emails users sent out to their network must connect with the recipient’s emotions. Otherwise, those messages will simply flop. This starts with the headline, the very first copy of your email a person sees. It’s also the most important element that affects a person’s decision to even open the message. Kickstarter, on the other hand, leaves the field empty, relying on a person to write something that will engage their recipients. Which means that the success of the referral is beyond their control. Next is the email body, the actual copy that aims to introduce a person to the project and convince them to check it out. Again, many fundraising platforms keep this section basic, including only the project’s name and URL. Look, the biggest challenge with social media messages isn’t what to say. It’s how to say it with so few words. After all, if you want your tweets or Facebook messages to have any impact, they need to be short. Really short. Unlike email, a social media post comprises of nothing but the headline. Let’s go through them in turn too. According to Buffer, the most powerful social media updates focus on evoking curiosity or stating a benefit of clicking on a link. Note that the message doesn’t include a project’s name or other details but focuses on engagement. But what to include in the message, specifically? Normally, we place links at the end of the social message. 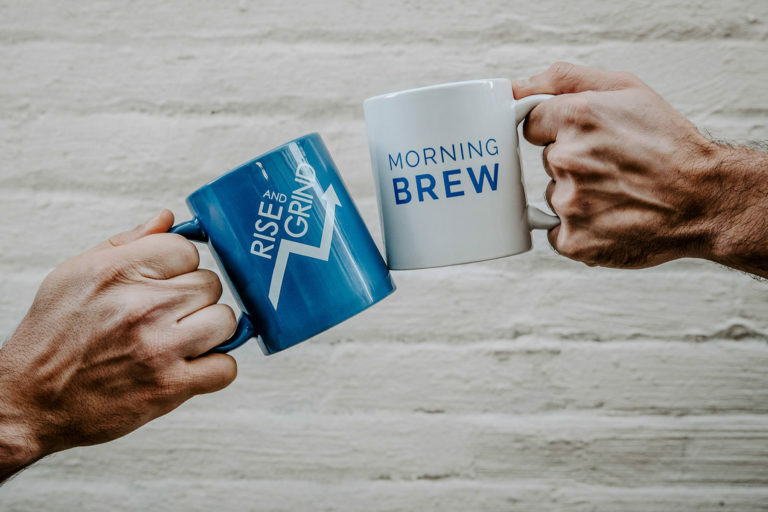 But as this research by Dan Zarrella revealed, social messages, particularly tweets, with links about 25% into the copy achieve much higher click-through rate than those with URLs at the end. All of the crowdfunding sites I’ve researched, however, place the link at the end of the tweet. 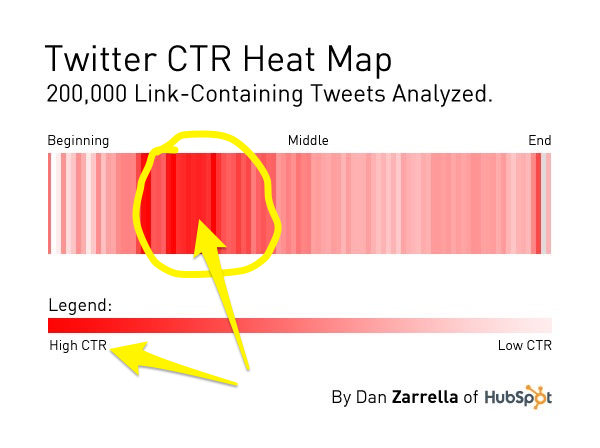 We click on tweets or Facebook posts with images more often than on those without. 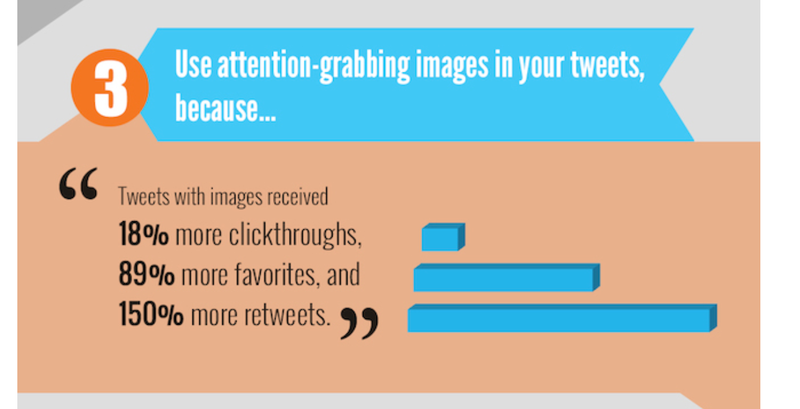 In fact, tweets with images receive a staggering 18% higher click-through rate. They also get 150% more retweets, further increasing their reach. However, in my research for this article, I didn’t find a crowdfunding site that would include a project’s picture in a tweet. But how different those updates would be if they included a visual representing the project? Striking, if you ask me. And considering the data above, they’d probably have a much better impact on the project’s virality. And then, ensure those shares result in clicks and traffic. Hopefully, after reading this post, you know exactly how to do it.